Immunogen: Synthetic peptide corresponding to the sequence near the C-terminus of mouse TNF receptor 2. Formulation: Liquid. In PBS, pH 7.6, containing 1% BSA and 0.1% sodium azide. Scientific Background: Tumor necrosis factor alpha (TNF alpha), also known as cachectin, is a 17.5 kDa 157 amino acid member of the TNF superfamily of cytokines that is a potent lymphoid factor with effects on a wide range of target cells. Active TNFalpha is produced in both soluble and membrane-anchored trimers by macrophages, NK cells, and T- and B-lymphocytes. TNF exerts proinflammatory signals via binding and inducing trimerization of TNF-receptor1 (TNF-R1) expressed on most normal and transformed cells, or to TNF-receptor 2 (TNF-R2), expressed on endothelial and most immune cells. TNF signaling regulates hematopeiesis, differentation, endothelial cell activation, apoptosis, lipid metabolism, tumor progression, and immune suveillance, and dysregulation of TNF or its receptors is implicated in numerous disease states including cancer, osteoporosis, autoimmune disease, diabetes, and atherosclerosis. 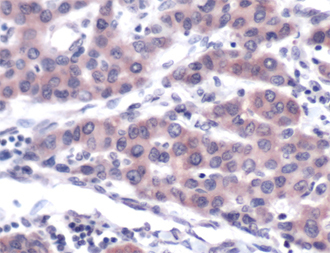 Immunohistochemistry analysis of human liver carcinoma stained with TNF receptor 2, pAb.